Here is China's latest Chinese fad: Tron power cars. 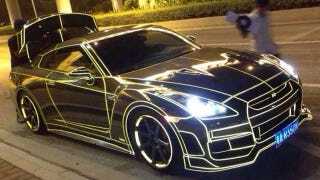 Because nothing is more high tech than BMWs, Lamborghinis, and Nissan GTRs decorated with 3M reflective vinyl tape. That's why their lunar rover failed—their engineers forgot to line it with neon blue tape.